A Beautiful house with plenty of opportunities for relaxation. The house was finished in December 2009 with exclusive materials. Take a bath in the outdoor Jacussi or swim in the heated pool (4x8m. ). After the swim you can enjoy a cold drink in the relax. We also have a small gym upstairs for the Active family/person or use the sauna that are located upstairs as well. Go running in the nice surrounding or just relax infront of the fire Place with a good book. A Beautiful house with plenty of opportunities for relaxation. Take a bath in the outdoor Jacussi or swim in the heated pool (4x8 m. ). We also have a small gym upstairs for the Active family/person or use the sauna that are located upstairs aswell. Go running in the nice surrounding or just relax infront of the fire Place with a good book. Two showers and two WC. In one bathroom you also have the Sauna and a wirhlpool tub. 5 bicycles that can be borrowed. Big deck surrounding the Swimmingpool and big table for at least 10 persons. Jet ski can be rented to experienced driver. Fabulous place to stay, very clean, great pool all mod cons. The outside- fab pool, warm water and easy to use cover. Outdoor shower, hot tub, which we used as a plunge pool (lovely),hammock, plenty of comfortable seating,large patio, hosepipe (we washed our sandy beach gear with this), swing, trampoline (no net), flat smooth driveway (our children scootered on this). Keypads on doors so no carrying (and losing ) keys. Ground Floor- spacious utility room (with washer and dryer), large lounge and well stocked kitchen. Breakfast bar and dining table with a kiddy sized chair perfect for 2-6 year olds. Beautifully styled and very homely. Downstairs bathroom with shower. Upstairs- air con, 4 bedrooms and a gym (weights, bike, punch bag). Spacious clean bathroom with sauna (didn’t use) and jacuzzi (tried but didn’t use as internal jets had got clogged up with gunk). Open staircase - young toddlers would need watching (1-2 year olds). We really enjoyed our stay here, and Micke was very responsive to messages. 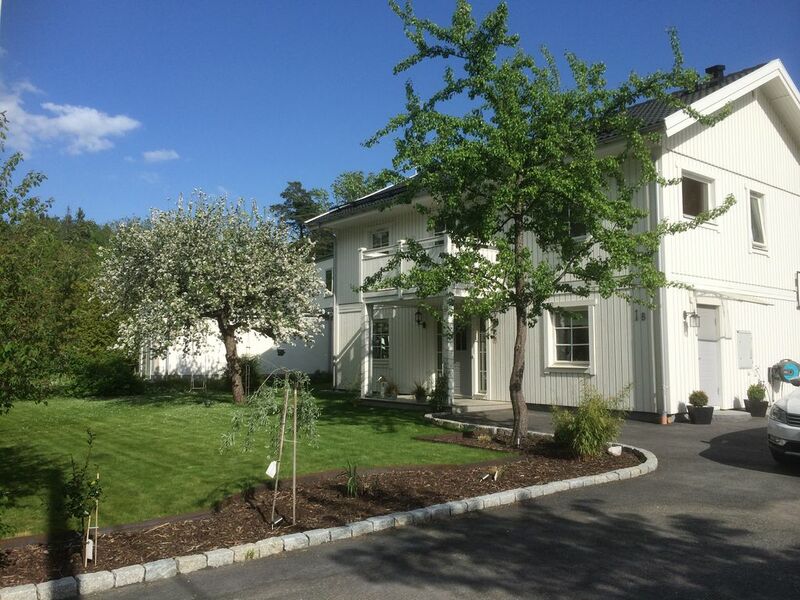 I’d love to return, both to this house and to Sweden. Thanks Jayne and you and your family are always welcome back. Wir waren bei unserer Ankunft sehr überrascht, daß es sich um ein Haus handelt, welches sonst von einer Familie bewohnt wird und somit sind viele private Dinge vorhanden sind, daran mussten wir uns erst gewöhnen. Dadurch ist aber alles vorhanden und wir durften alles benutzen. Wohnraum, Terrasse und Garten alles sehr schön und großzügig. Ist man mit der Famile dort hat man auch genügend Rückzugsmöglichkeiten z.B. das Wellnesshäuschen. Das Haus ist ein echter Traum, alles ist in einem top Zustand und sauber. Die gesamte Ausstattung ist hochwertig und optisch aufeinander abgestimmt. Die Lage zur Stadt mit 20 min ist hervorragend. Mickael und Maria (Vermieter) sind jederzeit hilfsbereit und melden sich bei fragen innerthalb von 1 h!! Das Ferienhaus hat eine super Ausstattung, es fehlt an nichts. Gewürze etc. dürfen benutzt werden. Alles sehr sauber. Man fühlte sich aufgrund der Videokamaras sehr sicher. Ruhige Lage, ist gerade für Familien sehr zu empfehlen. We stayed there for 7 nights. The house itself was perfectly clean, fully equipped with everything one could wish for, and made us feel at home almost instantly. The garden, pool and the jacuzzi and everything else were in perfect condition and we enjoyed those every day. The bus stop is nearby, to Stockholm it takes ca. 25 minutes. The host Mikael (Micke) is very friendly, helpful and very responsive (usually responds within 1 hour if anything comes up). If we are planning to get to Stockholm once more, we will surely try to stay here again! Mooi huis, fijn terras, uitstekend zwembad. Aardige verhuurders waar we uitsluitend digitaal contact mee gehad hebben, maar zeer behulpzaam. Walking distance to the ocean were you will find a sandy beach, small boat harbour and beautiful gravel roads for walking etc. 1,5 km from the villa you can also find a small lake with sandy beach.